Biology professor Ronald Calabrese, Emory College senior associate dean for research, won the 2017 Award for Education in Neuroscience from the Society for Neuroscience. 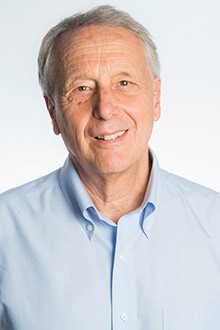 Ronald Calabrese, Emory College senior associate dean for research, has won the 2017 Award for Education in Neuroscience from the Society for Neuroscience in recognition of his 40-plus years educating students and developing the graduate program in neuroscience at Emory University. Calabrese will share in the award with Randy J. Nelson, a Distinguished University Professor and Brumbaugh Chair in Brain Research and Teaching at Ohio State University. “Both were instrumental in developing highly respected neuroscience programs at their respective institutions and have gone above and beyond expectations to teach neuroscience to those who want to learn,” SfN President Eric Nestler says in a statement. Calabrese served as the graduate program director for 11 years and an additional seven as the co-director of graduate studies. His lab studies how networks of interneurons produce activity in motor neurons to generate movement, modeling inclusive processes in the neural circuit that controls the heart of the medicinal leech. Emory College Dean Michael A. Elliott stated that he was proud to have a colleague who is being recognized for his work as a leading educator. “Ron understands how our research and teaching missions are deeply intertwined,” Elliott says, “and this award honors his accomplishments in advancing that union." Calabrese has also assumed multiple extramural neuroscience education responsibilities, teaching for two years at the Crete Course in Computational Neuroscience in Greece and at the EU Advanced Course in Computational Neuroscience. As an instructor, he spent 10 years teaching the University of Minnesota Summer Lab Course at Lake Itasca, Minnesota, and 35 years teaching the Woods Hole Neural System and Behavior course, an eight-week intensive lecture and laboratory course that draws neuroethologists and systems neuroscientists to Massachusetts from around the globe. Nelson, who holds PhDs in both psychology and endocrinology, was similarly instrumental in developing the undergraduate neuroscience program at Johns Hopkins University before developing an undergraduate major and minor in the field at Ohio State. He is perhaps best known for his collaborative lab, which welcomes scientists ranging from high schoolers to postdoctoral researchers. He has also dedicated much of his time to mentoring and providing opportunities for women, students from historically black universities and other minorities. The award will be jointly presented to Calabrese and Nelson at Neuroscience 2017, the society’s annual meeting Nov. 11-15 in Washington, D.C.